To facilitate the discussion, each PhD students had to chose three subjects that he felt like he needed help with. On the other hand, each staff had chosen three subjects in which they could give advices to PhD students. In the following pictures we can see some examples such as a last‐year PhD student (Peter Bradshaw) receiving advices from a post‐doc (Natasa Giallourou) about how to write efficiently a thesis, or also the Dr Jon Swann, reader in Microbiomics and Human Development, talking about NMR with a part of his team. Some boards were also made available, per subjects, so PhD students could find more easily the staff who could help them for the subjects they chose to talk about (1st year PhD students were happy to find some peers with whom they have been able to practice their Early Stage Review later in the month). campus. 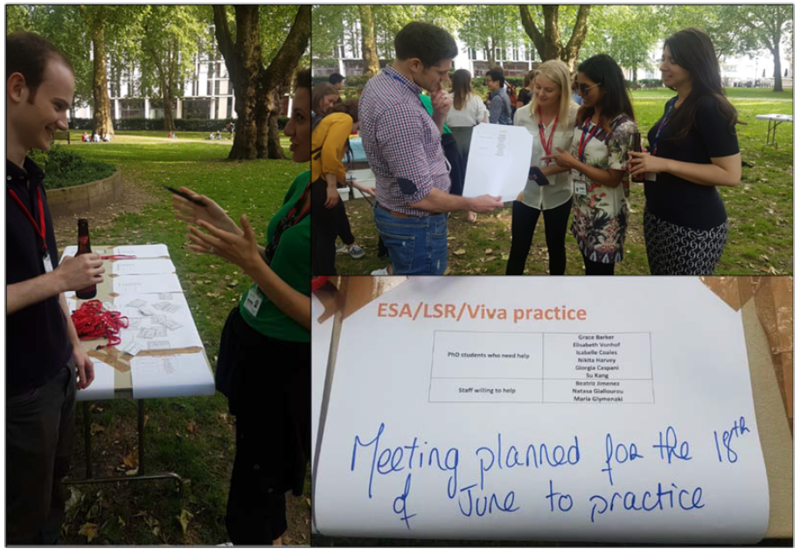 The LCMS MRC‐NIHR Phenome Centre (NPC) team came from Hammersmith Hospital to socialise with the PhD students, which are mostly based on South Kensington campus. Their CCO Matt Lewis was actively engaging himself, by taking care of the BBQ with Dr Antonis Myridakis to fed everyone. The great weather made the day even more enjoyable, and it pushes more people to join us along the day. It was also a great opportunity for the NMR NPC team to come with their new borns and present to everyone the new generation of scientists!